Our company – Active Travel Asia (ATA) – is offering Great Summer Promotion 2009 in Vietnam and Cambodia. These promotions are guaranteed by luxurious adventure tours, add-on values and good prices with 15-20% discount. All the tours chosen are the unique and special one with lot kinds of adventure travel activities such as biking, trekking, motorcycling, kayaking or hiking tours. We always put your rights and the values of the trip at the first place. As the result, you can get more benefits from offered tours by our company, five tours in Vietnam and three ones in Cambodia. If you are the persons who love adventure tours in Vietnam and Cambodia, contact with Active Travel Asia for your savings! First of all, Biking tour in the North West of Vietnam named West to East Biking Exploration in the North West of Vietnam. This tour is a real challenging for any cyclist. Good pacing that allow cyclist to get recovered after long rides. Stunning scenery, great culture experience with exploration of ethnic minorities. The single trail from Sapa to Lao Cai is the most beautiful one in Vietnam. Babe Lake is perfect to round off the trip. Secondly, trekking tour in Sapa named Sapa Long Trails which is another perfect choice for trekkers. Because, there is no doubt that Sapa is the best trek site in Indochina. This trek gets you to popular villages by longer and different trails. Graded at Moderate but lots of trekkers feel it easier since the trails and the scenery is so stunning. Homestay in villages of different ethnic minorities makes it a good combination of trek and culture exploration. Moreover, joining in Kayaking Halong Bay 3 days tours which is serious adventure kayaking, you will paddle to the furthest and most beautiful corners of Halong Bay and Lan Ha Bay, where you discover dark cave with your kayak and relax on beautiful hidden beaches. As paddling you will see a few or no other adventure kayaker around since this padding route is not popular and not for novice kayaker. The fifth tour in Vietnam is Northern Highlights. With this trip your family will together do some soft adventures since it is designed for family with kids. This trip offers you the bests Northern Vietnam has to offer. The trip can also be adjusted for more active travelers who seek for higher adventure grade. The first choice for you is Trek Ratanakiri in Cambodia. Whenever mentioning Cambodia, we often think of the great Angkor Wat. However, this trip will bring you to another world that you have never known before in Cambodia. Only a few active traveler has traveled to this remote area due to bad roads and lacking of information. 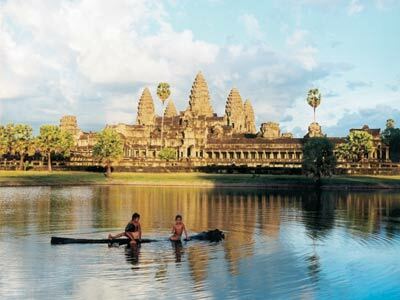 You will experience another world, another culture beside the great Angkor Wat that Cambodia has long been famous for. This is not only a big adventure but also a big discovery. Another choice for you is taking part in Angkor Wat Discovery tour which is known as one of the most beautiful and fascinating places in the world. Coming there you will visit many must-see famous temples such as Angkok Wat temple, Angkok Thom, and Banteay Srei and have a boat trip on the Tonle Sap. The last tour we offer is motorbiking adventure tours in Cambodia. This is the perfect choice for real riders. This trip offers mostly village road and dirt trails and it runs through back country, thus you will see real Cambodia, real Khmer culture. This is not a stuff for anyone but only for experienced riders who seek for serious riding. We all know Angkor Wat is a gem of this country. On this trip you will see some other gems that no other tourist can see. Active Travel Asia assures to provide the luxury services from the local guide’s knowledge and attitude, accommodation, entertainment…to other supplement services. Don’t miss an excellent chance with ATA!